Over the first weekend in March I took part in the first Science Hack Day Dublin an open data hacking event hosted in Dublin City University. The challenge was for participants to come up with open data related project ideas, to form groups, work on those projects and present the results all within 36 hours. Some initial project ideas were collected on a wiki page in the days before the Hack Day. Part of a set of interrelated project’s caught the eye of one of the organisers and he suggested that the submitters get in contact with me for some input and maybe to help. All the Aurora Orrery project’s revolved around the Aurora or in the northern hemisphere Aurora Borealis or Northern Lights. Which are caused by charged particles from the sun effected by the earths magnetic field interacting with the upper atmosphere. The result is a spectacular light show in the sky which is more visible as you get nearer the polar regions. But given a high level of of solar activity and favorable weather patterns, the Aurora can be seen from Ireland in places like Donegal and other parts of Northern Ireland. So using the available data sources the goal was to visualise current Aurora activity which could then be used to help predict future Aurora activity which would be visible from Ireland. 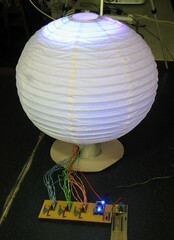 Obviously I took on the sub project that involved using LEDs to represent Aurora activity. So the Thursday before we had a quick exchange of ideas using twitter and email. I pointed out some of my previous LED projects and tried to get an idea of how many LEDs might be needed to give a reasonable effect. A response in the hundreds was overly ambitious for a one day event with almost no preparation time. So I collected up a bunch of useful through hole components, LEDs, prototype boards, wire, tools and micro controllers in shopping bags (about six). I got a hand bring them to DCU by some other members of TOG who helped build and run the network for the weekend. On the first day; nine project ideas were present through a series of parallel lighting talks and then a lot of ad hoc discussion between participants. Groups formed around the project ideas and the hacking began. I didn’t get started straight away as I spent some time talking through the design options and trying to decide what level of realism we could achieve. In the end with the time available and components I brought with me, I decided to build a 16 pixel RGB display with the pixels arranged in a ring. These could then illuminate the inside of a sphere or dome giving an Aurora effect forming an Aurora Lamp. The components I used were 16 5mm RGB Common Anode LEDs, an mbed NXP LPC1768 (which I’ve used in most of my recent projects), three TLC5941 (a 16 Channel LED Driver with PWM from Texas Instruments) and some resistors and capacitors. I had used a 28 pin HTSSOP version of the TLC5941 before but for this project I used the 28 pin DIP part as it could be plugged directly into a breadboard/stripboard. After quickly going through the TLC5941 datasheet I drew up a schematic for a driver board using gschem. I then assembled a prototype circuit on a couple of breadboards with just a couple of LEDs for testing. I used the source code from the previous TLC5941 project as a base. After couple of quick code revisions, uploading and testing I went ahead and started to solder up a stripboard version. The testing didn’t give me the exact results I was expecting but I went ahead anyway. 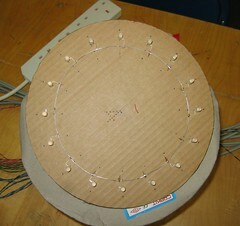 Once the driver board was fully soldered up I started working on the ring of LEDs. I used a piece of cardboard from pizza box to form the base and used a cable reel from a electrical cable to form a stand. Because I didn’t have a compass or protractor I used paper plates and pieces of folded paper to layout the correct angles and positions on the cardboard. Carefully using a craft knife I cut out the disk and cut small slots for the LEDs. The Common Anode lead of the LED was bent and then inserted through the small slot, then Anode leads where then soldered together with a ring of tinned wire. 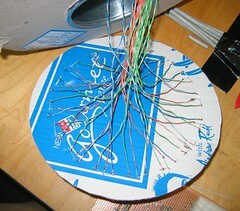 Using wire form cutup pieces of CAT5 cable I began soldering a wire to each LED Cathode and feeding it through the cable reel. I matched up the LED colours with the colour of the wires (red to orange/orange white, green to green/green white, blue to blue/blue white). I then connected these wires in to the connectors without sorting out the order but just matching up the colours. Then came the smoke test, good news no smoke. But I still wasn’t getting the result I was expecting. I should have been seeing the primary colors but the were mixed up a bit. The first TLC5941 was very hot maybe I had damaged it or connected it up incorrectly. So I began checking that the schematic was correct and that I had connected everything up correctly. I tried using another TCL5941, no luck. Even though I had pulled an all nighter, everything seemed correct to me. Then I started looking at the code in much more detail and compared it with code from another similar project. Fairly quickly I notice that the code I copied had used a different SPI port then the one I connected up in the schematic. A quick code change, recompile and reload and I got the solid primary colours I was expecting. What added to the confusion was that I did see some changes in colours. But I get the feeling that this was cased by breadboard/stripboard traces acting like small antennas, interesting. With about an hour left we began working on a dome to form the lamp. Connor was at home overnight and was able to find an old paper lamp shade in the shape of a sphere. We cut a hole out of the bottom of the shade so that the LED disk could fit inside. Using sheets of paper, wire and sticky tape we formed two tubes which help to keep the paper sphere upright. It would also help to direct the LED light to form a pleasing halo effect. The final task was to present my project for judging, I didn’t have time time or energy to do up slides so I just got the lights turned down a quickly described the project. Even with a poor presentation I won the Hardware Award (you can see the presentation photo here). So the end result of a weekends work (and some follow up work in TOG) can be seen in the follow slide show.